Fuel your passion and bring out the creativity in you! 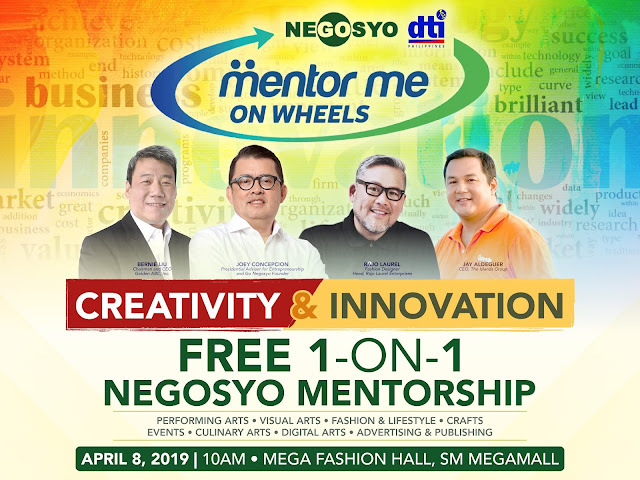 Go Negosyo in partnership with the Department of Trade and Industry will bring a special leg of Mentor ME On Wheels which will highlight negosyo mentorship on creativity and innovation this April 8, 2019 at the Fashion Hall, SM Megamall. “With the right mindset and level of creativity and innovation, most of you will shine and persevere in the business community. The government, with the help of DTI, Go Negosyo and the private sector, will be here to mentor you especially in areas on how to use and source money to grow your business and on how to reach more markets for your products and services.” Presidential Adviser for Entrepreneurship and Go Negosyo Founder Joey Concepcion emphasized. This leg will present panel discussions on tips on building a successful brand, conquering the world through design and innovation, and turning creativity to a successful enterprise. The roster of panelists and mentors includes Bernie Liu, CEO & President of Golden ABC Inc.; Rajo Laurel, Fashion Designer and Founder of House of Laurel; Jay Jonathan Aldeguer, President of Island Souvenirs Group among others. We will also have mentors on different creative categories such as Performing Arts (Acting, Music, Dance), Visual Arts (Graphic Design, Painting, Film and Photography, Architecture, Sculpture), Fashion and Lifestyle (Clothing, accessories, hairstyling, make-up, shoes, bags), Events (Wedding, Corporate events, Parties, Concerts), Crafts (Handicrafts), Culinary Arts (Catering, baking, sweets and pastries, cooking), Digital Arts (Animation, Web, Game, App & Software development Development,) and Advertising and Publishing. MMOW on Creativity and Innovation is a mentorship discussion with aspiring and existing MSMEs in the creative industry. It aims to elevate the level of creativity with the help of mentorship and digitalization that will give wider access to the market for their products and talents. Interested participants can pre-register through www.tinyurl.com/MMOWCreatives2019. Walk-ins are also welcome and may register on the day of the event. Limited slots available. SM Supermalls is an official venue partner of Mentor Me on Wheels. Watch out for the next leg of MMOW in your local malls! Download the Mentor Me App on Google Playstore and App Store.